It’s My Time…And Now I Don’t Want It. Having three kids in less than three years will do it to ya. It’ll make you long for the days when you can grocery shop alone. Shower regularly. And without interruption – can you imagine?! Drink a cuppa HOT coffee, without microwaving it 87 times. Need to get your hair done? Go for it! Catch up with an old friend over coffee? No problemo! Tell me where and what time! Have a house that stays neat for more than 1.2 seconds. It seems like a blip. I shop by myself a lot. I get a shower in most days, if not all, and get this – I sometimes even put on MAKEUP AND DRY MY HAIR. Over the weekend, my husband and I woke up ON OUR OWN (sorry, seems like I’m shouting, but sometimes it just requires caps…). The kids were all downstairs watching cartoons. Then they went to the playroom in the basement while Paul and I drank our HOT coffee and read the paper. (Sorry for the caps again). This is becoming our new norm. That part…well, that part is pretty awesome, not gonna lie. That whole sleep thing that eluded us for a good 3 years or so? It’s back in all it’s glory. And it’s as delicious as I remember it. Now I’m facing something I’ve been dreading since I became a mom. Registration is around the corner. The K word. For the last and final time. I throw up in my mouth a little at the mention of the word. I’ve been through this twice, you’d think I could at least say it without losing it. You see, this time…is my last time. Last baby. Going off into the world with his backpack that is bigger than him. On that big ol’ bus. Entering that big ol’ school. On his own. And I’ll turn around from the bus stop, walk home, and enter a quiet house. What I’d always dreamed about on those long days when I could barely catch a breath. Changing one kid, while feeding another, while coloring with another, and realizing at 4pm I’m still in my pajamas and have only put coffee into my body all day. Oh, how awesome will it be, when I have time to myself again! To shower! Get dressed! Have lunch with a friend – LUNCH! Can you just imagine? Well yes, now I can. And the only lunch date I want to imagine is one that takes place at my kitchen island filled with highchairs and booster seats and mac and cheese. Be careful what you wish for, moms of sweet babies and toddlers. I know you’re exhausted, and you just want to pee in peace. And comb your hair and make a phone call without a screaming toddler running circles around your legs. I get it. Believe me, I get it. But I promise you – you will blink. And one day it’ll all come true. I was good up until your last 2 sentences–made me cry. wow. this sums up my feelings completely. our youngest starts school in the fall and i am already dreading it. i’ll be completely lost being on my own during the day without her. i can’t even imagine it! i always love your posts on family life. Oh Liz, this was me last year. I cried and cried when my youngest got on the bus. It was a rough few weeks and I cried every day. My husband even bought me flowers because he could see what huge emotional roller coaster I was on. I will be forever thankful for the 8 years I stayed home with my boys and I hope they are grateful, too! A huge transition! Hugs. so sweet! this is such a good reminder for me. I have three little ones ages 4, almost 3 and a 2 month old. I am going through everything you wrote about, and sometimes I feel like a crazy lady.I But have recently realized how quickly time goes and how I need to appreciate every day I have with my 3 little ones while I am at home with them. I teared up with your last sentence. So true! Times passes by so quickly. I have been struggling with this same thing lately. Even now I get teary eyed thinking about it. I have a kindergartner and a 3 year old and I just try to “take it all in” bc I know they don’t stay little forever. When my 5 y/o asks me if I can carry him to bed, I don’t hesitate b/c I know the time is coming where I won’t be able to do that anymore. So true! The first of my two is starting Kindergarten and i can’t stand how grown up and how little she seems at the same time. Beautifully written. Thank you. Brings memories and little pangs of regret. But I’m also looking forward the next, and then the next, and then the next. I have one two years away from college, one about the embark in middle school and one that will be in 2nd grade next year. It’s all so spread out, but the blinks…they happen just as fast. You are so right! My oldest four are in school now and I am just trying to cherish these last two little guys. We cuddle tons, eat special food together (that the school kids don’t get), read lots of stories, and just try to love each other! This made me cry because I am in the middle of those baby years. I have a 15 month old and a 3 month old. Irish twins. I know I will miss those days. Yesterday I never changed from my pajamas and tripped over I dont know how many toys. I am definately going to miss these days. Thanks for the reminder. 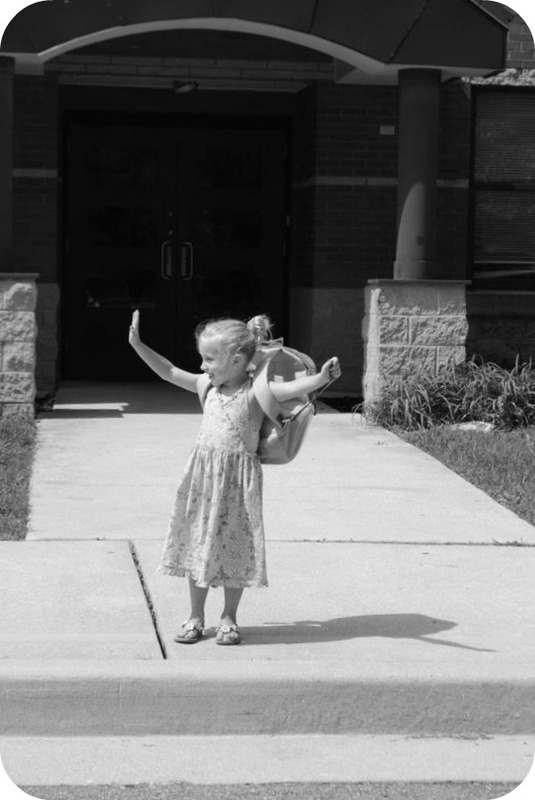 I sent my baby off to kindergarten this year and cried. I’m so happy it’s only half a day. I still get to have lunch with him. Next year I can’t imagine what I’ll do with my days. They’ll be laundry, cleaning, errands etc. And when I’m out and about and I see a young mom with kids in tow, it’ll make me wish I was that mom again. I was hanging in there until the last two sentences. Now, I’m crying in my cup of tea. Such a beautifully honest post, thank you for sharing! I just had my first baby 7 weeks ago and I’m so grateful for every moment I have at home with her. Time is already flying too quickly! Great post! I just posted about this yesterday…my daughter will be going to kindergarten in the fall and it is so bittersweet! My last baby enters kindergarten next year too, registration is in 2 weeks! I was just telling a friend that now that my son is so pleasant and fun and cute and sweet that I love spending all day with him, but soon will have to send him off. It is so emotional, glad I’m not alone! 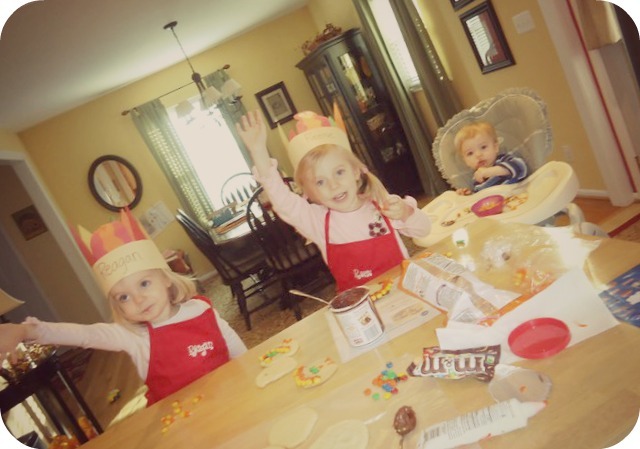 U always get me…i love reading all ur blog posts about kids & family. I just read your post and must say you just summed up my life all in one! I am about to go through the same thing. My last one will head off into her own independence, she can’t get enough of talking about “Big Girl School!. I’ve done this two other times but this time will be different. The tears will flow without a doubt but in turn my house will stay clean, I will be able to use the bathroom without someone asking where is mommy, I can shop and not feel like I have to run the 100 meter dash to get it done because someone might throw a fit. It will be an adjustment but I am sure I will get over that pretty quickly. I’m soaking up every minute until then but man will I miss those big brown eyes looking up at me without a care in the world! Kindergarten here we come! Don’t blink again… They will be going to college…in Florida !